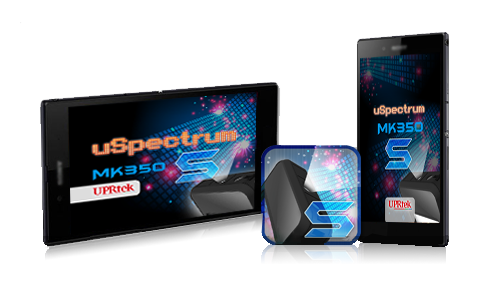 The MK350S is a lightweight, portable, easy-to-operate LED meter with WiFi remote control operations and SD card data storage. This product has basic features for fast, easy LED readings, as well as advanced light analytics, and efficient work-flow features for LED production environments. ◆ Enhanced screen resolution improvements from predecessor models. ◆ More than 30 light unit-of-measures to choose from. ◆ Standalone LED meter – No other equipment necessary (e.g. PC, Smartphone etc.). 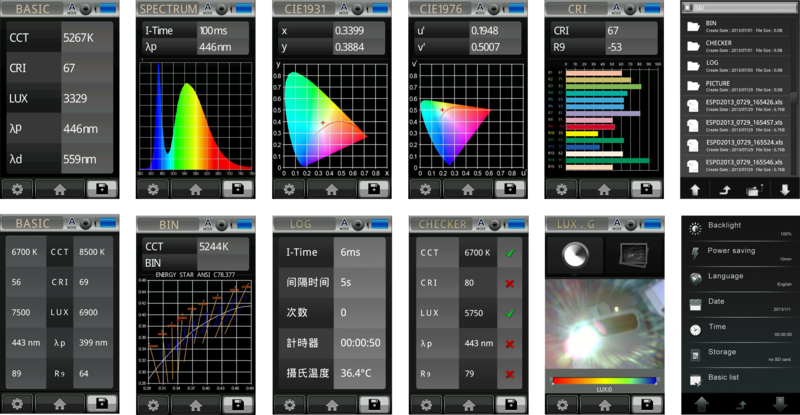 ◆ Illumination distribution charts provide assistance in fixture design. ◆ "BIN" ranking features allow for fast CIE 1931 inspection and confirmation of LED quality. ◆ Visual aim 'n click display (on-screen viewport) - No more blind measurements. ◆ Automatic continuous measurements with data-save to an SD car.d ◆ Easy, on-the-spot data comparison features – Comparing 2 LEDs, or comparing against historical data. 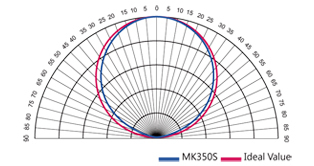 ◆ Maximum and minimum acceptable ranges for evaluating LED quality. ◆ Built-in file browser allows for quick access to previously saved dat. BASIC This screen shows a list of light measurements recorded after pressing the “Measure” button as demonstrated in the “Getting Started” section. 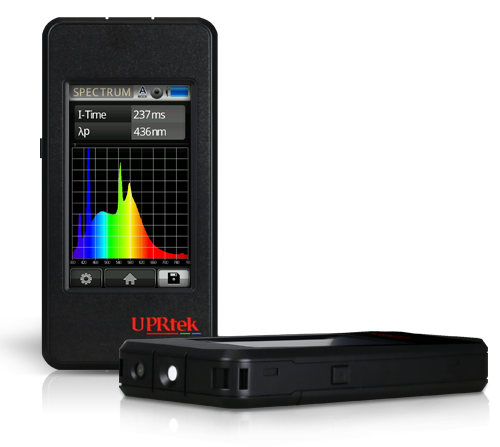 SPECTRUM Light Spectrum of the latest measurement taken. CIE 1931 The CIE1931 chromaticity x, y values of the latest measurement taken. 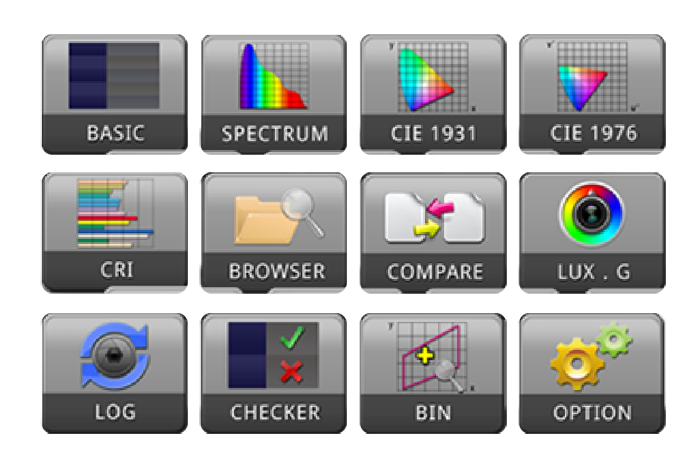 CIE 1976 The CIE1976 chromaticity u’, v’ values of the latest measurement taken. CRI The CRI R1-R15 values of the latest measurement taken. BROWSER The Browser (on Home Screen) allows you to review historical data that was previously saved to the SD card. COMPARE The Compare item allows you to compare two measurements side by side. You can compare two consecutive measurements or compare a measurement against historical data (SD card). LUX. G The LUX. G item is a unique feature important for interior designers and lighting professionals. It gives a visual representation of light distribution in a scene, giving you a reference for environment light design (homes, libraries,offices, museums etc.). LOG The LOG function is used to continuously capture several measurements in sequence. 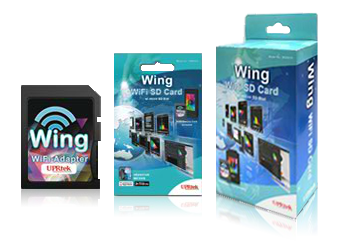 the data will capture AND save to the SD Card. CHECKER The Checker function allows you to see if the values of an LED measurement fall within an acceptable range of values. BIN The BIN function serves to assist LED manufacturers and buyers in measuring and then classifying LEDs for “Bins” as defined by classifications according to USA Energy Star ANSI C78.377. if it has any changes will not give any notice.